Super Bowl LIII MVP Julian Edelman stopped by "The Ellen DeGeneres Show" to proudly show off the Lombardi Trophy and walked away with a fresh shave. In a preview of Edelman's appearance on Friday's show, the New England Patriots wide receiver expressed gratitude to his parents for supporting his career and talked about what being named Super Bowl MVP meant to him and his family. "Getting the MVP is kind of a win for my other team, and that's my family. Getting to experience this with them, because they've been in my corner, they've made me who I am, this is like a full family kind of win," he explained. Host Ellen DeGeneres, who is known for her antics, surprised the three-time Super Bowl champion with the official MVP trophy before moving on to the subject of his beard, which he said he did not shave all season. "Coach (Bill) Belichick has this thing that he says, 'Put everything in the drawer and worry about it when the season's done,' so I put my razor actually in the drawer." "Do you think he meant razor?" DeGeneres asked. "He said everything," Edelman replied. "He's a scary, intimidating man." 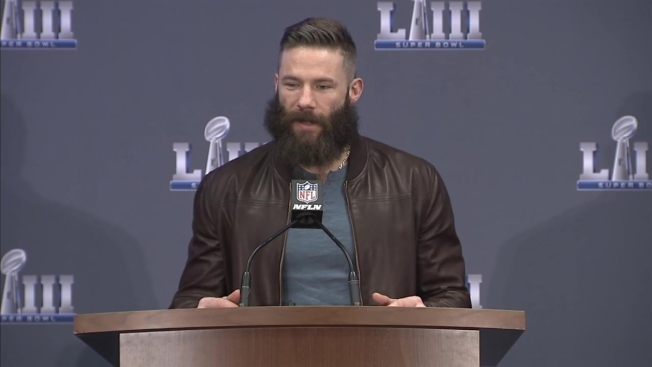 The talk show host then said she would donate $10,000 to the Boys and Girls Club if she could shave Edelman's beard. He was a bit hesitant at first, but ultimately was happy to get a fresh trim and the opportunity to be charitable. So much so that Edelman offered to match DeGeneres' donation, raising a total of $20,000 for the organization. This makes the wide receiver the second Patriots player to trim some hair this week in the name of charity. Tom Brady got a clean shave at Gillette World Shaving Headquarters on Thursday. "The Ellen DeGeneres Show" airs at 4 p.m. ET on NBC.